I think the very best promotion in the Grand Rapids market during my tenure as WOOD’s Program Director was that of a competitor. In 1984 WCUZ put Dennis Sutton up on a billboard. The billboard was an elaborate design by the marketing genius of Greg Hagley at Rogers Department Store. It actually had a little house where Sutton liveduntil the Detroit Tigers lost a game. That was a championship year for Detroit and Dennis was up on that billboard for a long time. That promotion generated market wide buzz. A dream come true to those behind the promotion and a nightmare to competitors. We did some good stuff at WOOD too. Road shows to Ireland and London were highlights. We took hundreds of listeners over the years to Dublin for St. Patrick’s Day. Of course WOODs strong ties with Disneyworld gave us a front row seat to a multitude of new attraction openings at WDW. We did several broadcasts from various locations at Disneyworld. Perhaps the best promotion we did was the brainchild of Gary Allen. The Baby Boomers Birthday Bash. We rounded up the markets original top 40 DJ’s and turned the station into a blast from the past on a Friday. Bill Merchant, and Skip Bell were flown in for the event. Tom Quain, Jim Francis and even Bruce Grant rounded out the lineup. Mel Vandegavel did the news. We tweaked the audio processing on the station with some reverb and used old 1960s jingles. That night we capped it off with a dance on the Monroe Mall. The Kingtones played to a huge crowd. What a day!!! In the end, the promotions that people remember are the good ones. And my experience is that they really are fairly simple. Pictured – top row Skip Essick, Tom Quain. Middle row – Mel Vandegavel, Mark Roberts, Gary Allen. 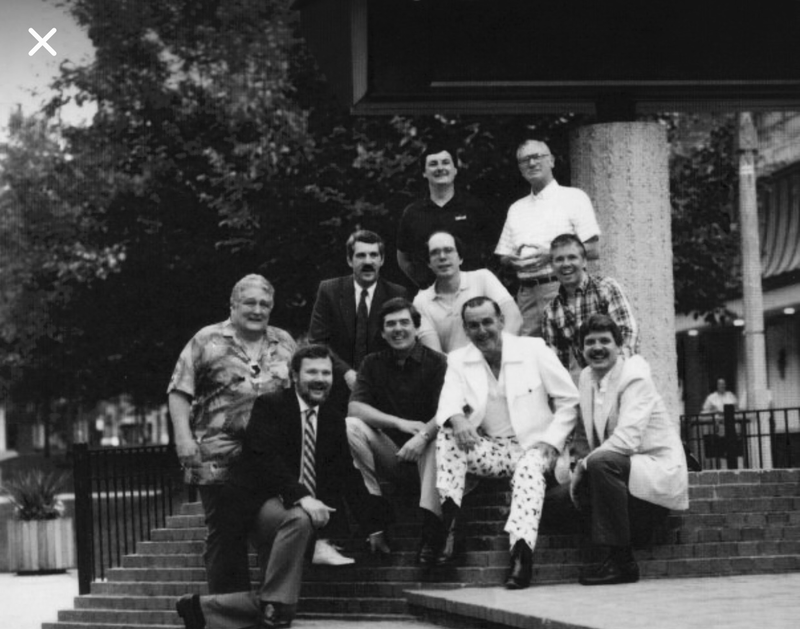 Front row – Bill Merchant, Jim Francis, Gary Bazner, Skip Bell, Chuck Bailey. I remember that photo. The only reason I wasn’t in it was because I took that picture. What a great time. I still have my original copy taped to my computer desk.